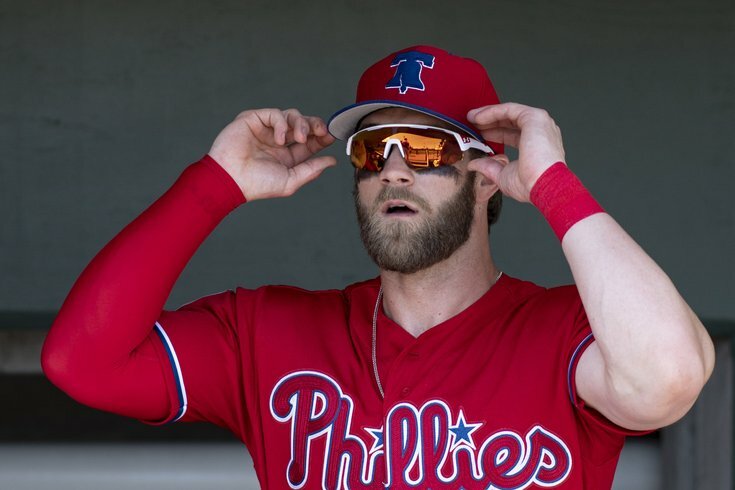 Philadelphia Phillies outfielder Bryce Harper stands in the dugout prior to the game between the Philadelphia Phillies and the Toronto Blue Jays. Prize free agent acquisition Bryce Harper finally broke into form on Thursday, knocking two home runs out of the park in a spring training game against the Toronto Blue Jays. Harper's start to the preseason had been largely uneventful, outside the team dodging a bullet on a nasty fastball to the ankle last week. On Thursday, during a blowout of the Blue Jays, Harper came alive. Here's a look at both of his blasts, in the first and sixth innings. The second literally sailed over some palm trees and left the park. Maybe Mike Trout's mega-deal with the Angels woke Harper up just in time for the start of the regular season next Friday. Let's hope this is a sign of things to come for the next 13 years.